Charity allows for a list of possible justifications for a sequel to My Big Fat Greek Wedding beyond mere filthy lucre. For one thing, there’s no reason that sequels trailing their predecessors by a decade-plus should be limited to summer blockbusters and cult comedies. Hollywood studios are often correctly charged with catering unproductively to a dwindling audience of teenagers and boy-men, and a Greek Wedding follow-up certainly doesn’t embrace that demographic. A smaller-scale 14-years-later sequel also presents opportunities to ruminate on the passage of time; in this way, My Big Fat Greek Wedding 2 is, at least on paper, more akin to Before Midnight than to Jurassic World. Then again, My Big Fat Greek Wedding doesn’t especially need charity. The 2002 romantic comedy and family farce played for months and made more money than any movie that year not based on a comic book or another movie. Its star and writer, Nia Vardalos, has done well enough for herself that most of her subsequent film appearances have been starring roles in movies she also wrote. None have come close to Greek Wedding’s success, but what does? Some of these projects have danced around sequelizing her big hit; she reunited with onscreen husband John Corbett for 2009’s (mostly loathed) I Hate Valentine’s Day, and a sitcom, My Big Fat Greek Life, ran for an abbreviated single season during the tail-end of the film’s theatrical release. That was over a decade ago—almost two full presidential administrations, and countless Spider-Man movies—but My Big Fat Greek Wedding 2 doesn’t offer much sense of how much time has passed since its predecessor. 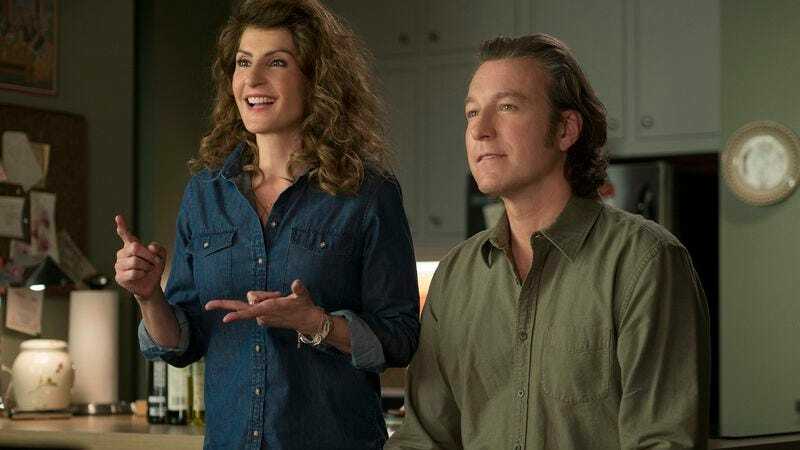 More time, in fact, has gone by on screen than it has in real life; the daughter of Greek gal Toula (Nia Vardalos), and decidedly non-Greek guy Ian (John Corbett), glimpsed in the first movie’s epilogue but born well after the events of that 2002 film, is now a 17-year-old high school senior. This means that Paris (Elena Kampouris) is weighing her college options, with her parents and extended family now hoping against hope that she chooses to stay close to home in Chicago. The smothered have become the smothering, the meddled-with have become the meddlers, and Paris is appropriately mortified by this turn of events, particularly her mother’s neediness. Yet the movie doesn’t push too hard at the idea of Toula assimilating herself back into her family’s roving pack of loud, meddlesome Greeks, because it doesn’t push too hard at any of its unbaked subplots. Toula’s family angst shares screen time with another set of wedding plans when her parents Gus (Michael Constantine) and Maria (Lainie Kazan) find out that they were never technically, officially married. This is of no more consequence than any other storyline in the Greek Wedding series, but it does give a substantial part to longtime character actor Kazan, who hints at a lifetime of accumulated regrets in the run-up to her de facto remarriage. Maria has spent her life attempting to sooth a cranky Greek nationalist obsessed with Alexander The Great, working for no pay at a diner whose clientele seems to primarily consist of her extended family and occasionally John Stamos (although it’s not clear if Stamos, cameoing as a handsome newscaster as part of his recent and slightly smug goodwill tour, actually orders anything). Kazan briefly taps into a reservoir of sadness about the small joys and noisy agonies of her family life, and the movie rushes to resolve her story without quite looking her in the eye. There’s been a slight upgrade in directorial pedigree, from sitcom vet Joel Zwick to twinkly feature director Kirk Jones (Waking Ned Devine), but My Big Fat Greek Wedding 2 often looks washed out, and Jones has limited ideas about funny staging. His go-to move is mashing two to 10 people together into an awkward scrum, then cutting to Vardalos or Paris watching with wide-eyed discomfort. The would-be secret weapon is Andrea Martin as Toula’s aunt, mugging like crazy and entering every scene as if waiting for a studio audience to cheer her on; the whole movie is full of laugh-track-ready pauses. Amidst all those pauses, all those still-running gags about Windex and Greek origins of words, and all those wispy subplots, there is the passage of time—always present but only occasionally commented upon. The movie’s denial of the finite is so pronounced that when Paris attends her prom with a guy she’s barely talked to (Alex Wolff, brother of Nat and every bit the poor man’s version), the bittersweetness of beginning a new relationship as she’s preparing to leave for college never lands. Everything in the movie winds up feeling mindlessly cyclical: Gus is ailing, but maybe Windex will heal him where physical therapy cannot. Toula and Ian’s child is leaving the nest, and all Toula can do is joke about adopting another baby. The Greeks, like many people, behave as if they’ll all live forever, and the movie never quibbles. Maybe Vardalos should revisit this material when she’s ready to write My Big Fat Greek Funeral.